UPDATE: Find tracklisting and cover artwork on this location. UPDATE 2: Watch the "Fly From Here" EPK here. 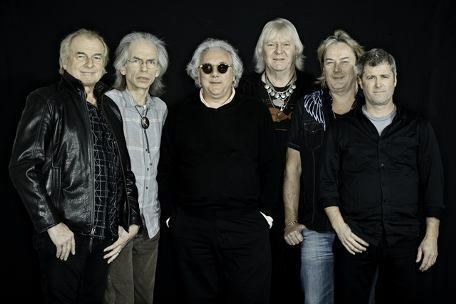 Quintessential prog-rockers Yes have announced that they have reunited with legendary producer Trevor Horn for their highly anticipated new album, "Fly From Here". The album marks the band's first studio album in ten years. The album originated from a conversation between Horn and Yes bassist Chris Squire, who re-discovered the song 'Fly From Here' and realized that it had never been recorded in a studio. "Chris and I were talking one evening about the song 'Fly From Here' that we never recorded," explains Horn. "I said I was prepared to spend two weeks with Yes recording that song. When I arrived in America to record it, I was taken prisoner by the band and only allowed my freedom again in return for producing the whole album. It was an offer I couldn't refuse!" "Fly From Here" retains Yes' signature brand of mysticism and large-scale compositions. The record contains plenty of the complex arrangements, beautiful harmonies, and heavy riffs the band is known for. "The new album represents the best of Yes from the '70s and the '80s with a current twist," said Squire. Keyboardist Geoff Downes, who originally joined the band for 1980's "Drama,", has also re-joined the band for the new album. Yes now consists of guitarist Steve Howe, bassist Chris Squire, drummer Alan White, keyboardist Downes, and lead singer Benoit David. With total sales of over 30 million albums, Yes are widely considered to be the pioneers of the prog-rock movement. The group is also known for radio classics such as "Roundabout", a seminal hit that consistently appears on 'the best songs of all time' lists, and the Horn-produced hit "Owner of a Lonely Heart". The latter song reached the top of both the UK and US singles charts simultaneously. 'Fly From Here' will be released on Frontiers Records in July 2011.Read an interview with Chris Squire on this location. "The latter song ["Owner of a Lonely Heart"] reached the top of both the UK and US singles charts simultaneously." No, it didn't. It only made #28 in the UK, but another Horn-produced record (Frankie Goes to Hollywood's "Relax") was #1 in the UK at the same time as "Owner..." was in the US. This minor point aside, thanks for the great article! The details are important - thanx! This was unexpected. I guess Olivers busy with Strawbs and his own band. He can't do everything his old man did. I was getting used to seeing him and David as I went out of town for them. Now it looks like I'll be seeing double on the road this year with both Messrs Howe and Downes. Also, John Wetton and Carl Palmer in Asia have solo projects ongoing so its back and forth for all of them. Who is that man in the "middle" (sunglasses)? Une toute bonne nouvelle ; je regrette juste que ce ne soit pas Anderson au chant (ou... Trevor Horn), voire même Trevor Rabin - qui par ailleurs formerait, avec Howe, une équipe tout à fait complémentaire de guitaristes. Je pense ceci dit que ce sera un tout bon album, l'influence de Squire est évidente et bienvenue. Vivement Juillet. J'ai le nouvel album de Yes depuis sa parution et je le trouve vraiment très bon, du début à la fin, exception faite peut-être de la pièce de Squire " The man you always wanted me to be " qui semble être une chute de studio de Conspiracy. Mais peu importe, le reste est vraiment très bon, sauf qu'il y a un tout petit détail qui me chiquotte, la voix que l'on entend sur l'album, j'ai écouté encore et encore, et j'ai toujours cette drôle d'impression d'entendre Trevor Horn chanter les voix principales plutôt que Benoit David. Et plus encore sur les chansons de la suite " We can fly " qui avaient déjà été enregistrées par les Buggles, je ne perçois aucune différence sur les deux versions pour ce qui est des voix. Alors je me pose sérieusement la question, quel rôle Benoit David a-t'il réellement joué sur ce nouvel opus de Yes ? I guess Olivers busy with Strawbs and his personal band. The future update, expected in early office 2013 activation key 2014, appears set to include a notification center, enhanced multitasking, and changes to built-in apps. We understand that upgrade to windows 8 pro pack Microsoft is thinking about back porting some of the "Blue" attributes, including a rotation lock option, to a GDR3 update due later this year.